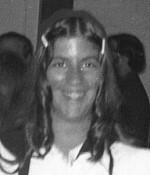 The 1973 unsolved homicide of Anne Psaradelis. On July 12, 1973 two fifteen-year-old girls from Merrimack, NH, Anne Psaradelis and Diane Compagna went missing. They had been seen at Hampton Beach and were last seen hitchhiking in the direction of Merrimack late in the afternoon of July 12th. It was first thought that they had run away, but two months went by without any word from either girl. Their badly decomposed bodies were discovered on September 29, 1973 in the woods off of New Boston Road in Candia, NH. The area is within a short distance of Route 101, which is the road leading from Merrimack to Hampton Beach. The manner of death was undetermined because of the condition of the bodies but it is believed that the girls were strangled to death.